Planning for a weekend getaway this summer? 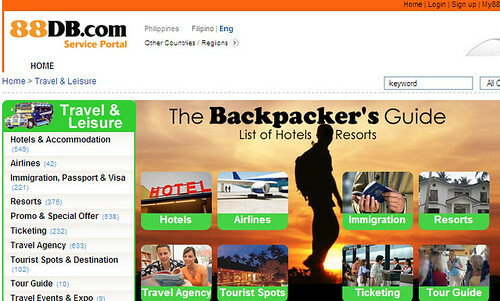 Head on to 88DB.com’s Travel & Leisure section for a very extensive directory of anything and everything travel. From tour packages to holiday villas to visa and passport assistance, you’re sure to find a service provider to fit your needs. Actually, they have a LOT of listings that it’s easy to be overwhelmed by all that information. However, you can easily filter the entries by typing in specific keywords (e.g. “hotels in Boracay”) in the search box. Another feature that 88DB.com’s travel section has is the travel forum, wherein you can ask questions or seek recommendations for the places you plan on visiting. And if that’s not enough, they also threw in some travel photos and articles to get you pumped up about your trip. So if you’re looking for a travel agent, cheap tour packages or a house to rent for the weekend, check out 88DB.com. You might just find what you are looking for.